It sure is a good time to be a Disney and Nintendo fan. Not only do DS gamers now have their hands on a new Kingdom Hearts game, Wii owners will be getting in on a new House of Mouse exclusive: Epic Mickey. Not much has been known about this secret Junction Studios project other than it is said to be steampunk-influenced. Based on the latest issue of GameInformer and its cover (that should be hitting subscribers around the 12th), we also know that Mickey is armed with a brush of sorts and that the art direction will probably be darker than the mouse is accustomed to. Even those that aren't big Mickey fans will want to keep an eye on this one, as a certain Mr. Warren Spector has his hands all over this. If the name isn't ringing any bells, perhaps PC titles Deus Ex, Thief, System Shock and Wing Commander will; he's played large roles in all of these acclaimed titles. Edit : At least though the Wii locked in an exclusive. I just love how one of the tags for this game is Awesomesauce. This is great news indeed. I just hope that it lives up to the hype. Hey I got a question. Is this similar to Kingdom Hearts ? I do not follow DIsney but my nieces are between 6 and 11 and they are huge into Disney and my brother is thinking about getting them a Wii for Christmas. I have never played Kingdom Hearts or a Disney game. Just curious and if you answer me thanks in advance. @Devil_Hunter_Dante: We don't really know much about the game other than what's in the post; Game Informer are the ones that have the exclusive and so far it's all held tight to their chest. Based on Spector's previous output and the art so far, though, I'm going to have so say that this isn't necessarily aimed squarely at kids. Steampunk? Mickey?? Does not compute. Confused. Looks incredible, I saw the artwork and I hope it is a part of this game! Wii-EXCLUSIVE?! zOMG! Take that Sony and Microsoft! @Panda Thank you ! I really do not know much about Disney but its all I hear from my nieces. I guess we will all find out sooner or later. If they see Mickey in a game they are going to go nuts lol. Nice, it is a must-buy for me! Thought it said Epic Monkey...lol. Anyways, yeah...I'll keep an eye on this. holy crap! This looks like a sequal to Mickey Mouse's 'Castle of Illusion' for the Genesis! I lOVED that game when i was a kid, the artwork looks amazing in this pic. Epic Mickey? MORE LIKE EPIC WIN!!! I'm amazed some consider this some sort of killer app. I remember an awesome Mickey Mouse game on the Sega Genisis (at least I thought it was awesome back when I played it). I hope this is awesome too. I gotta be honest: That poster is one of the most awesome things I've ever seen! Could we finally have a good Mickey game after the excelent ones on the Mega Drive. Now they just have to make sure this is plays well and I'll buy it! Mickey has a magic brush? Oh look, its Shadow Mickey! as long as they change the name, i'm game.... epic mickey.... so horrible. whoa....never expected Mickey to ever have a concept like this! this is gonna be freaking awesome! I don't get it. what is the game about anyway? That spread pic looks amazing I can't wait for more details about the game! Man I cannot wait for this game to come out. If the game is awesome and sells well, maybe we'll finally start to see Disney supporting the Virtual Console. I think the cover alone just is... wow... unbelievable wow... If I saw just this image anywhere else I would swear it was some kind of joke. Cool, hopefully we can get more info on it soon! The Magical Quest starring Mickey Mouse for the SNES, and Mickey Mania for Genesis were AMAZING games. I can't wait for this! I saw some concept art for this a long time ago on IGN, only I think it was on the PC channel and I think they were making it sound like it was canceled. Spector's involvement has me intrigued, as Deus Ex is perhaps my favorite game ever. After Kingdom Hearts ANYTHING about Disney or Mickey is that great, isn't it??? Click on the artwork in the article - View it full sized. Looks wild! The mouse himself appears to be dripping bleeding paint. Fantasia like rhythms spring to mind. We will all have to try swinging this paint brush around. 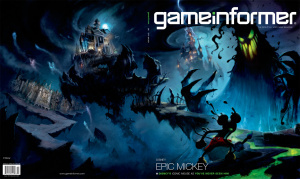 I never would've guessed Game Informer would do a cover story on Mickey Mouse! Of course, I wouldn't have guessed a Mickey Mouse game would ever look as grown up as this cover art suggests. Finally, an issue of Game Informer I'm actually looking forward to! I'm really intrigued by this game. Curious to see the first screens and find out what kind of game this really is. But it's great that it's a Wii Exclusive. BUT I DIDN't Get My Game informer yet! It looks very nice, but what is it?, can't wait to hear more about it. For me Deus Ex is one of the best games ever made. I hope Warren has not lost his ability to make quality games. Looking forward to Mickey. As I looked at that picture, I could almost smell the paint... then I realized it was just some candle nearby. But yeah this looks awesome! Can't wait to give this one a spin. Or a brush as the case may be. @the fox - indeed. I am not saying that this game won't be good but...how can you get excited about a game nobody knows a thing?! just for a kinda cliched image? MICKEY FOR EPIC WIN OF THE YEAR! Hmm, now i know what GI was referring to when they recently mentioned that they'd have a Wii-exclusive cover story this fall (in response to someone who asked why the cover stories are almost always PS3/360). I hope the rumored/supposed storyline is true -- that Disney's pre-Mickey characters (particularly Oswald the Lucky Rabbit) that were pushed by the wayside when Mickey & Co took off in popularity show up to take over the Magic Kingdom/Disney Universe and generally ruin Mickey and friends. @Dicesukeinuzuka: Neither did anyone else. The article says it should be coming to subscribers around October 12th. This piece of info came from Gameinformer.com, which routinely reveals its next cover a week or two in advance. @the shpydar: Oh yeah, I remember them saying that! Cool deal. That rumored plot sounds pretty cool, too. More early-Disney geeky than the Steamboat Willie area in Kingdom Hearts 2! After the complete and utter trash that was known as Kingdom Hearts (which buy the way, I can play it right now without a game disc: xxxxxxxxxxxxxxxxxxxxxxxxxxxxx oh yes so fun! Not. ), I say the less exposure this game that's also sure to be horrible gets, the better. Disney should just close shop anyway: when was the last time they made anything worthwhile in any medium? All they seem to be crapping out these days are Hannah Montana and Jonas Brothers monstrosities. Requesting game's name is changed to "Epic FAIL Mickey" ASAP. @mjc0961: A bit harsh, isn't it? Lay off Kingdom Hearts, will you? That's one of my favorite game series. I'll agree that as far as TV goes, Disney isn't worth too much lately. But they still have something to offer. Whoa. Sounds pretty cool. Please don't drop the ball on this one Nintendo..
mjc0961, stop bashing Kingdom Hearts. It's a great series. @Koto: Believe it or not, he's not a COMPLETE idiot. I know him from elsewhere, and he's a pretty cool guy for this most part. It's a real shame his post on this comment thread doesn't make that clear AT ALL. I feel odd about this... I would try the game (which may end up bought), but I like Mickey all cutesy. Has anyone besides me noticed how creepy the picture looks? I think it's gonna be awesome, I don't think Disney gonna let it be as dark as the concept art. I'm thrilled it's got Oswald tho!!!! !